Winter storms with heavy snowfalls, high winds, and a coating of ice are a threat to our vulnerable power grid. Making winter even more of a threat recently is the current economic upheaval. In economically depressed places like Detroit, many residents have had their utilities shut off due to an inability to pay their bills. With temperatures in the negatives, people could quite literally freeze to death in their homes. You don’t have to be a prepper to realize that secondary heating systems, some specialized skills, and a frigid weather plan could be vital to your survival in the winter. Are you prepared for a winter power outage? Here are some options for heat that doesn’t come from a thermostat on the wall. Wood Heat: Everyone’s favorite off-grid heating method is a fireplace or woodstove. The fuel is renewable and you have the added bonus of an off-grid cooking method. Unfortunately, if your home doesn’t already have one, it can be a pretty expensive thing to install. If you rent, it’s probably not going to be an option at all to add wood heat to someone else’s property. If you have wood heat, make sure you have a good supply of seasoned firewood that is well-protected from the elements. will warm up to 200 square feet. Be sure to stock up on propane if this is your backup heat method. can heat up to 1000 square feet efficiently. When we lived in the city I was lucky enough to have an antique “Perfection” oil heater, which was a charming addition to our decor that was called into service during grid-down situations. Click here to read more information about the different types of kerosene heaters that are available. Natural Gas Fireplaces: Some gas-fueled fireplaces will work when the electrical power goes out – they just won’t blow out heat via the fan. What if you don’t have a secondary heating method? Sometimes things happen before we get our preps in order. If you don’t have a secondary heating method, you can still stay relatively warm for at least a couple of days if you are strategic. Even if you do have a secondary heat source, in many cases it’s important to conserve your fuel as much as possible. If you have no additional heat at all, you can usually keep one room tolerable for 2-3 days. If the cold is relentless and the outage lasts longer than that, you may need to seek other shelter. Watch your temperatures. If the daytime temperature in the house dips below 40 degrees, the nighttime temperature will be even colder, and it won’t be safe to stay there, especially if you have children or family members who are more susceptible to illness. These methods can help you stay cozier during a storm. Cover your windows. You can use a plastic shower curtain and duct tape, topped by a heavy quilt to keep the wind from whistling through your windows. Take down the quilt if it’s sunny outside for some solar gain, then cover it back up as darkness falls. If you have reason to be concerned about OPSEC, use heavy black garbage bags to cover the windows to keep light from escaping. Not only do we need to be concerned about a power outage due to the weather, but we also need to realize that utility bills could be extraordinarily high this year due to rising prices and an increased need for heat as temperatures plummet. When we lived in our drafty cabin up North, we had to take extra steps to keep warm. Here are some things we learned that will help out in either circumstance. Get up and get moving. It goes without saying that physical activity will increase your body temperature. If you’re cold, get up and clean something, dance with your kids, play tug-of-war with the dog, or do a chore. which we top with fluffy comforters for a cozy place to relax. (carefully wrapped to avoid burns) under the blankets with you. on every window. Then, we insulated further by placing draft blockers at the bottom of the window sill (I just used rolled up polar fleece – I’m not much of a sew-er.) This was topped by a heavy blanket, taking care to overlap the wall and window edges with it. Over that, we hung thermal curtains that remained closed. Wear fingerless gloves. Gloves like these allow you to still function by keeping the tips of your fingers uncovered, while still keeping chilly hands bundled up. Drink hot beverages. There’s a reason Grandma always gave you a mug of cocoa after you finished building that snowman. Warm up from the inside out with a cup of coffee, tea, cider, or hot chocolate. Bonus: Holding the mug makes your hands toasty warm. What if you’re stranded due to icy roads? What if you’re not at home when a winter storm strikes? In a previous article about preparing your vehicle for winter, I brought up a couple of situations that occurred last year. During one scenario, a freak snowstorm struck the Atlanta, Georgia area. Because weather like this is such a rarity, the area was completely unprepared, officials didn’t have the experience or equipment needed to deal with it, and traffic gridlocked almost immediately. Hundreds of people were stranded as the freeway turned into a scene reminiscent of The Walking Dead, with bumper-to-bumper vehicles at a standstill. Those without food and water in their vehicles went hungry, and many people ran out of gas as they tried to keep warm. No matter how comfortable you are with winter driving, in a situation like this, you are at the mercy of others who may not be so experienced. Regardless of why you’re stranded somewhere besides your cozy home, you should have supplies in your vehicle to fend off frostbite (or even death) due to frigid conditions. You can find a much more detailed vehicle emergency kit HERE. 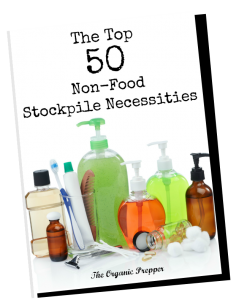 Even if you aren’t a prepper, it only makes sense to get ready for a storm. Unless you think the entire process of weather forecasting is some sort of insane voodoo, then it’s pretty undeniable that a big storm is coming. Winters in America have been setting records for bone-numbing, snot-freezing cold for the last couple of years, and it appears that this winter will be no different. 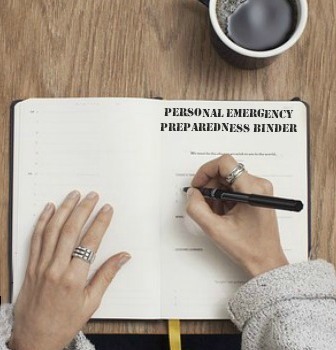 While some folks aren’t quite ready to plunge wholeheartedly into prepping, it’s hard to deny the common sense factor of preparing for a likely scenario. You should have at the minimum, a two-week supply of food and other necessities. Before the power goes out, develop a plan to keep your family warm, even while the mercury outside reaches near-Arctic depths.